If you’re a freelancer, doing creative-y things, then it won’t take but a small push to get you from No Products zomg! to Hey I Gots a Product. Let’s look at the numbers for Your First Infoproduct. Say you typically charge $75/hr. Your rate may be higher or lower; adjust as necessary. I bet you could make and begin to market an infoproduct in 75 hours or fewer. Dave Navarro says you can do one in a weekend. I agree. That means your infoproduct would have a freelance opportunity cost of $5,625 (75 hours • $75 hourly billing). Price your short, sweet, punchy infoproduct at $19. Sell 75 copies at launch, that nets you $1,425. Don’t freak. It’s not hard to sell 75 copies. If you have an audience of 200 to 400 people, and you create a product offer that speaks to them, that solves a problem for them, you’ll have no problem at all. So, $5,625 (Hourly Potential Earnings, an opportunity cost of creating a product) minus $1,425 (Product Launch Earnings) is $4,200. Let’s call that the Wage Slave vs Freedom Gestalt. That’s still a big number, in favor of freelancing. You’ve done a little bit of other marketing: put a banner in your sidebar, blogged about your launch, posted on forums with it in your signature, basically made sure you didn’t commit the criminal mistake of Not Tellin’ Nobody. So you keep selling copies. Slowly, of course, since you’re no marketing genius. Let’s say you sell another 15 copies per month for the first 2 months. That’s $285 x 2 = $570. Your total product earnings are now up to $1,995 (hurry, act now!). Gestalt is still big. So you gird your loins and do you a little bit of extra marketing. Take two hours of your time ($150 opportunity cost) and write 3 more blog posts that appeal to the audience for your book, create an infographic, release a bit of open source code, post more on forums, and so on. Update your sales page with some customer quotes. Send a couple review copies out. Your Gestalt increases slightly. Hey, what’s this you find? That tiny bit of effort was almost like another launch! Sell 30 copies. $1995 + $570 (30 copies) = $2,565. You now rest on your well-padded laurels. Your monthly sales are up to 20 copies a month on average, though, because of your extra bit of marketing. For the rest of the year (10 months), you earn an average of $380 a month in sales – $3,800 in total. $3,800 (10 months’ coasting) plus $2,565 (launch, relaunch, first 2 months’ sales) = $6,365. Your original Hourly Potential Earnings was $5,625 plus two extra hours of marketing at $150 = $5,775. Congratulations. 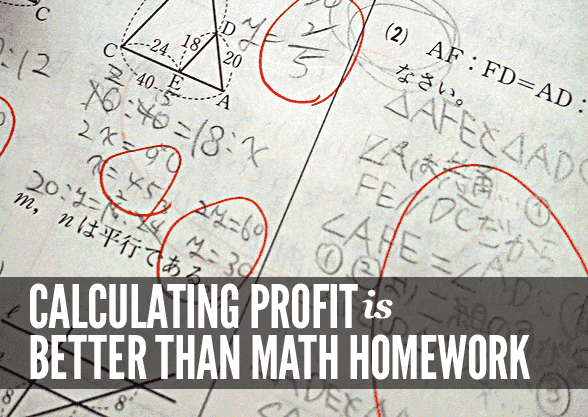 You did better than break-even on on the opportunity cost, by 10.2%. Your Wage Slave vs Freedom Gestalt is a negative number: doing a single freelance job, for the same amount of time, would have been 10.2% less profitable. You charge $75/hr. You spent 75 hours (+ 2 later) creating and marketing your product. You priced your infoproduct at $19, and sold 75 copies at launch. You then sold 15 copies a month for two months (average). You did another mini-launch and sold 30 copies. Your extra marketing paid off with an increase to 20 copies per month for the next 10 months (average). That math is a no-brainer, if you ask me.